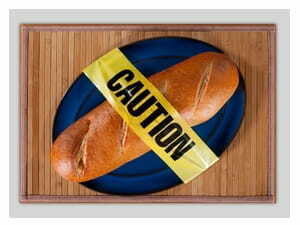 I am a diabetic and I can’t eat bread, which I really like. It is hard to make a fast lunch without two slices of “the worst food. I know we diabetics can use mushrooms, tomatoes and cucumber slices etc. instead of bread but they are not as satisfying. as far as I am personally concerned. The following article was sent to me and I couldn’t resist publishing it (with permission.) I can’t vouch for the scientific accuracy but I found this guest blog supported my endocrinologist’s instructions. As it turns out, baked wheat products contain carcinogenic chemicals called acrylamides that form in the browned portion of breads, cereals, muffins, etc. These carcinogenic acrylamides have been linked in studies to a possible increased risk of cancer and accelerated aging. Note that acrylamides are also found in high levels in other browned carbohydrate sources such as french fries or any other browned starchy foods. Don’t worry though… There’s a trick that you can use to protect yourself from these carcinogenic acrylamides, and it has to do with eating the RIGHT foods that COUNTERACT damage from these nasty chemicals.